Combine the lemon zest, herbs, spices, salt and pepper together in a small bowl. 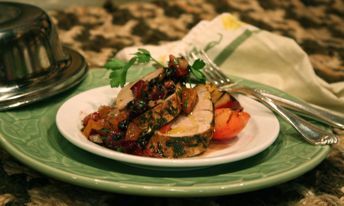 Rub pork with olive oil, then coat with the herb/spice mix; let pork marinate for at least 2 hours and up to 24 hours. Heat grill to medium heat. Place pork on grill; cook until internal temperature reaches 155°, turning pork occasionally to mark all sides. Transfer to plate and let rest for 10 minutes before slicing. Slice & serve with grilled plum salsa. Place currants, balsamic vinegar, and cabernet in a small saucepan on low heat. Simmer until currants are slightly softened, about 1 minute. Remove from the heat and let cool in the liquid. (This can also be done in the microwave, just heat until the liquid begins to boil, remove from the microwave and let cool). Preheat grill to medium heat. Lightly oil the plums and onions; place on grill and cook just long enough to heat through and produce grill marks. Note: do not overcook the fruit or it will be too soft to cut. Transfer plums and onions to cutting board; cut into small dice and place in a small bowl. Add the cooled currants and any liquid from the pan, dry mustard, herbs, clove, and salt and pepper to taste. Drizzle with 1 Tbsp of extra virgin olive oil. If the fruit is not very ripe, you may need to add a pinch of brown sugar to balance the flavors.